You're probably insanely sick of alllll of our posts about Japan, but friends we are just getting started! We have finally edited some photos and are ready to start posting the nitty, gritty details. We took some video and will have a couple vlogs as well. I just really wanted to document this trip and even though I always wish I had done more, I'm pretty happy with what we've got. I decided not to try and post blogs or vlogs while we were there, because I wanted to go late into the night and wake up early just experiencing Japan, and I didn't want to waste time blogging or editing photos while I was in that amazing country! So hopefully over the next week or two I'll get everything posted, but bear with me if I don't! We went and grabbed a hot chocolate and some Starbucks sandwiches and then we were off! When we got to LA we were already past security so we didn't have to do anything else! We grabbed some food (a last minute burger before we were far away from American food) and boarded our plane. We flew Air China, and as you'll understand through these blog posts, we absolutely HATED it. We will NEVER fly Air China again. The flights were a lot cheaper (we saved about $400) but it was NOT worth it. On our flight to LA we had a few movies to choose from which was nice, but there was no air conditioning on the plane and the plane was really old, and the seats were incredibly uncomfortable. I slept for about 4 hours of the 12 hour flight, and Randy only slept for about an hour. The food was also absolutely horrible, chicken in sauce over rice or noodles with wilted salad and frozen rolls. At "dinner" I almost sobbed when I saw Milano cookies because I was so happy to have some food I knew would be edible. I try really hard not to be picky, but Air China was a disaster. We landed in Beijing after 12 hours and we were a wreck. The Beijing airport is also terrifying. Everyone was pretty rude, there were people in military uniforms circling and hovering and yelling at us in Chinese, and even the other passengers were pretty rude and unhelpful. In security everyone had to get patted down and that was scary, our stuff got all rifled through and we were just pretty upset with the whole experience. Needless to say, after we got on our last plane from Beijing to Japan, we were in tears just hoping to get there. Luckily, this plane was smaller and more comfortable, so we slept from Beijing to Japan. We landed in Tokyo and instantly felt SO much better. The airport was lovely and everyone was SO amazingly nice. Randy was able to go up and ask some people where to get our Pocket WiFi (another thing I HIGHLY recommend. We'll get into details on how to get it in our tips post). We figured out how to get on the free shuttle to our hotel. We got there and checked in, everyone was SO helpful and kind, and we got to our room. It was TINY but all Japanese hotel rooms are tiny, and it ended up being the largest one we had on our whole trip. But really, there's barely room to turn around, but we didn't even care. We crashed on the bed and tried to catch up on some missed sleep! In the plane we passed over the date-line, so it was Wednesday night at about 9:30 when we actually got to Japan. We walked across the street to Sukiya, one of Randy's favorite restaurants. Apparently it's more of a "fast food" type of place in Japan, but it was out of this world amazing! I order a bowl of raw tuna and rice, with miso soup and Randy got guydon (beef, egg and rice) and both were SO good! I was in awe of how fresh this "fast food" tuna was, it was better than any sushi I'd had in Utah! We walked to the Family Mart convenience store down the street and grabbed some mints and chapstick, and then walked back to our hotel. We hopped on the free shuttle and went back to the airport to pick up our Japan Rail Passes. Everything in Japan is accessible by train, and as a tourist we could get basically an "all access" train pass during our stay. But we had to pick up these passes from the airport, and it had been closed when we got in. We got our passes with the help of a really nice lady who spoke a little English, hopped on a monorail and were off to Tokyo station! The trains are all SO insanely clean, always on time, and the great thing is that everything in Tokyo and the major cities is in Japanese and in English. We changed trains in the Tokyo station and went two stops further, to Bakurocho Station. We quickly walked to our hotel and dropped off our stuff. It was so nice, we got to most of our hotels before we could check in and they would let us drop our stuff off so we didn't have to carry it around. The city was SO quiet even though it was huge, it surprised me throughout our entire trip! We quickly called our families and grabbed some drinks from a store, then back on the train and into downtown Tokyo! At Tokyo station we had to go get reservations for our Shinkansen (bullet train) the next day. After we got all that figured out, we walked out and were in the heart of Tokyo! We saw the old Tokyo station that was being renovated which was beautiful. We then climbed onto the roof of this building and oversaw the city, which was insanely awesome. We walked through the city into Ginza which was SO busy. We went during Golden Week which is a HUGE holiday in Japan. Most people are out of school and some are off of work, so they were all in the city and at some of the sites hanging out. We walked past the most beautiful Tiffany and Company, so we had to walk in. The cute saleslady was SO nice and wanted to practice her English with us. She was telling us all about how she learned English watching Desperate Housewives and she was just too nice. We went shopping a bit and just took in Ginza, and then we were STARVING but everywhere had long lines outside because it was so packed in Ginza. We finally decided just to go to this downstairs restaurant we happened upon that had a good looking menu, and it was the BEST DECISION. We had tempura and sashimi and soba, and it was SO fresh and delicious. One thing I love about Japan is how they welcome you in and how everyone in the restaurant greets you when you walk in. It's so fun and exciting. I was still getting used to mugi-cha which they serve to you more often than water. It's a barley drink that tastes a little strange, and I'm still not totally used to it! After lunch we walked through Ginza a bit more, saw a very terrifying recital hall which was silent, but had about 10 people in it smiling at you and handing out fliers. Pretty weird. We saw Shake Shack which we thought was hilarious, and it had about an hour long line out front which we also thought was super funny. We walked to the Edo Imperial castle where the Imperial family lives, and it was amazing. So beautiful and with the traditional structure, right in the middle of the city. We were obsessed with it! We had to go check into our hotel, so we walked back to Tokyo station and went to Backurocho. We checked in and rested for about 10 minutes, then it was back to Tokyo station and on to Shibuya. We got off the train and the stations in both Tokyo and Shibuya are absolutely insane. SO many people and it is SO easy to get lost. I was super overwhelmed but it was so cool at the same time. We got out of the station and into downtown just as the sun was going down and all the lights were turning on. We crossed the busiest crosswalk in the world which is absolute madness, and saw the "Times Square" of Japan. It was SO amazing and unreal! We wandered the streets taking pictures and trying things out, just having the best time in the world. We went to kaiten sushi, or conveyor belt sushi for dinner, and it was SO fun! We ordered things on the screen and a conveyor belt brought our orders out for us (see the video) I loved it and the sushi was SO good I thought I would die! 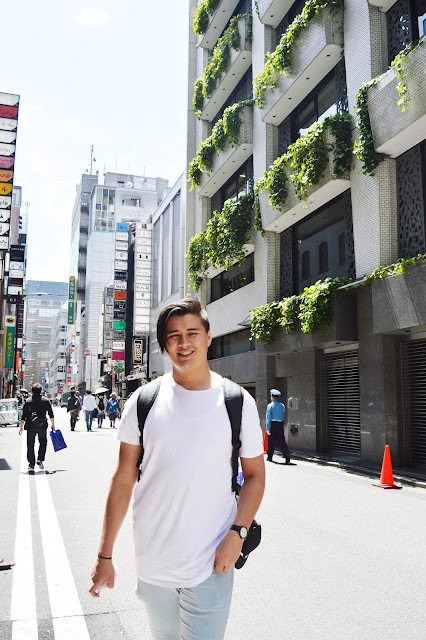 We spent more time in Shibuya checking out the streets and vendors until we could barely walk. Then it was back on the train, and then to our hotel. We fell into bed and crashed, knowing we were waking up SUPER early the next morning again!